If you are moving to Bentonville, Arkansas - this is a must read! 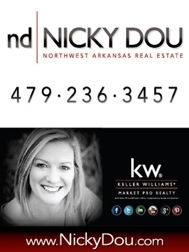 I am a top Realtor in Northwest Arkansas and I have helped many families relocate to Bentonville and I always run into this: "I just can't seem to find much when googling Bentonville, AR" - I think that is because so much of Northwest Arkansas is clumped together as "Northwest Arkansas" and most people that are relocating to Bentonville - for WalMart or a Vendor - they do not realize this. So - try googling Northwest Arkansas instead... OR just use my links below to help you navigate through what Bentonville Arkansas has to offer! I have lived in Northwest Arkansas all of my life. Born and raised in Springdale... Attended the University of Arkansas and lived in Fayetteville for a good number of years and now I currently reside in Bentonville with my husband, Jerry and beautiful daughter, Madison. Bentonville, Arkansas is best known for being HOME OF WALMART.